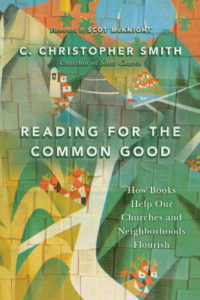 In Reading for the Common Good, C. Christopher Smith imparts a vision for the local impact that can come through deliberately reading together across a broad range of subjects and taking collective action from what learn for the good of our communities. Reading is more than an individual effort for our own enrichment. It is a way for us to join efforts toward the flourishing that God intends for the world. The book’s theme follows up well on what Smith and co-author John Pattison presented in Slow Church. The local church is to be a learning organization that continues its reading together over time with slow and deliberate intent. While focused on the local church and using many examples from the author’s home church, Reading for the Common Good is relevant to any groups of people who want to join together to learn and impact their local communities. This broader vision for not only reading scripture but for finding and exploring books with themes relevant to the common good is an emphasis not often found in discussions about what it means to be the local church. One of the pertinent themes explored is the importance of reading to civil dialogue. We need to be reading together to promote our mutual flourishing and to reimagine how society as a whole can change through what we are learning on the local level. This contrasts with the emphasis that is usually directed at the federal level in discussions for social and political change. Change starts locally and in our communities through reading and acting upon what we learn together. Reading for the Common Good motivated me to find more readers focused on similar themes and to work toward my reading being a collective rather than individual effort. It inspired me with a vision for the impact that can be made when people are learning and working together. The book also introduces relevant books of fiction, non-fiction and poetry across a variety of themes and lists all of the mentioned books in the back. This is a reading list that could keep one busy for a long time. I highly recommend Reading for the Common Good for those who wish to inspire groups of people to learn together and to impact their communities.